Dosatron has the only water powered chemical injector that is NSF/ANSI 61 & 372 Certified. 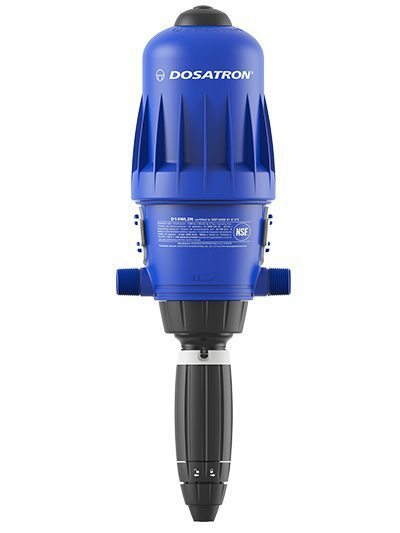 The NSF-certified 14 gallon per minute Dosatron D14 unit is ideal for injection of water treatment chemicals like chlorine and soda ash in residential applications. Water-powered pumps offer several advantages. They are very easy to install, require no electricity, and feed the injected chemical proportionally, depending on the rate of flow through the pipe. This means they can be installed at any place in the water line without flow switches or the expensive metering equipment required with electric pumps installed after the well’s pressure tank. The fully adjustable D14 Dosatron injects at a flow rate of 1:500 to 1:50. It is a compact pump that installs directly into the water line. As water runs to the point of use, the pump injects the water treatment chemical into the line. It can be used to disinfect non-potable water or to pre-treat for iron, manganese, and hydrogen sulfide filters. It can be used for pH alteration with vinegar, citric acid, or soda ash. In most cases it is not practical for use with hydrogen peroxide. The pump is so light that it can be supported by the pipe itself, or it can be wall mounted (bracket is included) and installed with hose connections. Dosatron offers an easy way to add chlorine or soda ash treatment. It is durable and easy to service, and parts are readily available. Water driven pumps are ideal for off-grid applications or any remote location where electricity is not available. 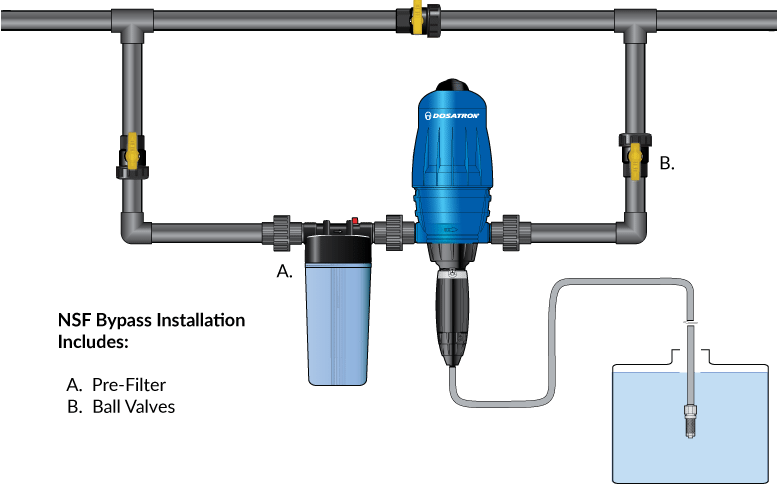 Dosatron is ideal for feeding chlorine (regular household bleach) in front of iron, manganese, or hydrogen sulfide filters, or for making non-potable water safe to drink. The D14 works in any application where the water being treated runs 14 gallons per minute or less. The D14WL2NAF is the NSF-certified, drinking water grade of Dosatron units. It should not be confused with Dosatron models intended for agricultural use that are sold on many websites. More information from the manufacturer’s website.